Cozad Community Schools is pleased to offer you e~Funds for Schools. This program offers various options for parents/guardians wanting to make payments online, and it is extremely user friendly. 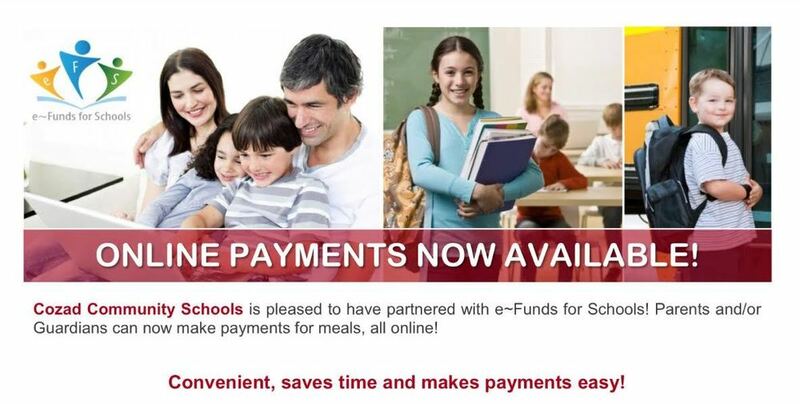 Not only will you have the ability to have meal payments electronically withdrawn from your checking account or charged to your credit card, you also have the flexibility to make a payment at any time through the school's website. The e~Funds for Schools electronic payment service is provided to the school by a third-party service provider. You are in full control of your account and can make payments at any time that is convenient for you. No payments will be accepted without your knowledge and authorization. By providing your home or work email address, an email notification informing you of the student’s name, purpose of the payment, and the amount of the item, will be sent to you each time that a payment is to be processed. The e~Funds for Schools site is secure and uses industry standard data encryption. The district does not request or keep records of family checking or credit card account information to use this service. ● Families set up and maintain their own logins, passwords and payment preferences. Your account information is retained in a password-protected file. ● Online payments will help eliminate the worry that your children could lose or forget the money intended for meals or that it might be spent on other non-school related items. ● Payments from a credit card or checking account may easily be set up. ● Parents/Guardians may establish a reoccurring payment or may opt to make a one-time payment. ● Your payment history for the year is available with the click of the mouse. To get started, follow the Step-by-Step below or contact the District Office by calling (308) 784-2745. 3. Under the PARENTS menu, click PAYMENTS. 4. Click on Create an Account. 7. Account has been created, you may now login. 4. Enter student Last Name and Family/Student ID#. 6. Repeat steps 2-5 to add additional students. 4. Select New Credit Card or New Direct Debit to add new payment information. 5. After entering all required information, read Consent and select Add to save information to account. 2. Select Make a Payment. 5. Enter amount of payment and click Add to Cart. 7. Choose payment method or enter new method. 8. Review items and total.